Cockroaches are a public health risk. They are responsible for the mechanical transfer of many human diseases, in particular intestinal diseases such as salmonella food poisoning. They also contaminate food products, utensils and other areas with droppings, egg casings, regurgitation marks and dead bodies. Some people are also allergic to cockroaches causing skin irritation to sensitive people or triggering asthma attack in asthmatics. Apart from this, their mere presence is generally abhorred by most people. Treatment of cockroaches must be thorough and include the following areas:- subfloor area, roof void, cracks and crevices in areas such as kitchen, bathroom and laundry, interior and exterior perimeters. Other harborage areas such as garage, outbuildings, storage piles, wall cavities, pavement cracks, retaining walls and fences must also be treated. For effective management of cockroaches, contact Novopest today. Ants are a nuisance. Their invasion of pantries, kitchens and bathrooms are notoriously annoying and can be costly if food items need to be thrown out. Small dirt mounds resulting from their excavations can be unsightly along paths, on balconies, around skirting boards and architrave bases. Their role in mechanical disease transmission cannot be overlooked as they scavenge for food in garbage bins, dog excrement and other possible sources of disease. Ants account for 10% of the total body mass of all the animals on earth! This by weight of numbers alone is going make their management difficult. When treating ants the offending colony needs to be directly targeted as residual surface treatments are of little value. This can be achieved with the close inspection, location and direct treatment of the ant nest. If the nest cannot be located the use of bait technology can be employed and the indirect treatment of the colony achieved when the ants return home to the nest with the bait. For effective management of ants, contact Novopest today. Spiders are dangerous. Apart from unsightly webs around a dwelling, spiders can inflict a painful bite, sometimes resulting in complications, hospitalization and even death. There are many species of spiders in and around our homes all of which fall into the following three categories:- webbing, ground dwelling and nomadic. Webbing spiders tend to stay in one location relying on their silken webs to catch prey. Common house spiders such as the Red back spider and Black House Spider typically build their webs around windows, guttering, outside walls, outdoor furniture, subfloor and roof void areas. They tend not to be aggressive however will bite if provoked. 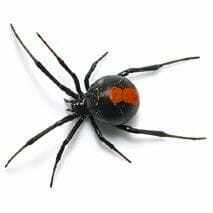 People are particularly prone to Red Back Spider bite when they nest under chairs, in shoes, outdoor furniture, swing sets, verandah ledges and stored items. Large orb web building spiders will build their webs between dwellings, trees, shrubs, external structures etc. People have been known to create various unusual and comical moves when unwittingly walking into such webs. Management of webbing spiders can be achieved with a thorough treatment to all exterior areas such as outside walls, windows, eves, fascias, fences, outbuildings, foliage, out door furniture, children's play equipment etc. Ground dwelling spiders typically build their nests in the ground, garden areas and rockeries. The Sydney Funnelweb Spider is the most dangerous ground dwelling spider and the male can often be found wandering during January to March in search of a mate. Treatment of these spiders needs to be directly to the nest area if it is able to be located. It is best to try avoiding their bite by employing common sense measures such wearing leather gloves whilst gardening, checking shoes before wearing, not placing bear hand in pool skimmer basket, not leaving toys and clothes out overnight, wearing sensible footwear when walking outside etc. Nomadic spiders such as Huntsman and Whitetail spiders are often found wandering though the house appearing on walls, floors, storage cupboards etc. The Huntsman is considered non toxic and seldom bites, however due to its large hairy appearance can be the cause of fright and anxiety in some people. The Whitetail spider is not aggressive but will bite if touched or placed on the body inside clothing. The bites are painful and may lead to ulceration. It has been recorded that necrosis of the surrounding tissue may develop. Management of nomadic spiders is similar to webbing spiders but must also include treatment to voids such as the roof and subfloor areas. for effective management of spiders, contact Novopest today. Silverfish can be destructive. They feed on most types of human food but seem to prefer starchy materials. Damage can occur when silverfish feed on items such as paper, photographs, books, wallpaper, cottons and linens. They can be found in all areas of a dwelling and usually prefer dark undisturbed areas such as roof voids and storage cupboards. They are also often found in wet areas such as the bathroom, kitchen and laundry. When managing silverfish infestations particular attention needs to be paid to voids such as the roof and subfloor, skirting boards, cracks and crevices around storage areas as well as wall cavities where possible. For effective management of silverfish, contact Novopest today. Carpet beetles don't just eat carpet. The larvae of Carpet Beetle may feed on or in wool, fur, hair, silk, clothes, fabrics, rugs, under felts, felts, fibre-type insulation, dried insect specimens, animal carcasses, bee and wasp nests, stored foods including dried meats, seeds, grains and serials. Damaged materials, sand like larval droppings or bristly cast skins may reveal the presence of Carpet Beetle activity. A thorough inspection to the premises must first be carried out prior to implementing any treatment strategies. For example larvae feeding on the carpet may be supplied by adults who are feeding on a rat carcass in the roof void or hot water insulation in some other location. Treatment to the affected area as well as areas such as skirting boards, storage cupboards and roof voids may also be necessary for successful management. For effective management of carpet beetles, contact Novopest today.